Tomatoes still ripening on the bush, a basket of freshly picked produce, and a wheel of cheddar sliced into quarters ready for the cheese fridge. Simple things to feel so proud of, but feel proud of them I do. I think perhaps the term 'living the simple life' isn't so much referring to your way of life sometimes, but that living like this teaches you to appreciate such simple things. My pledge to continue to grow food through summer is proving to be a hard one to stick to. All but one tomato bush has withered, although to be fair I think that is because of a soil problem in that garden, not the weather. 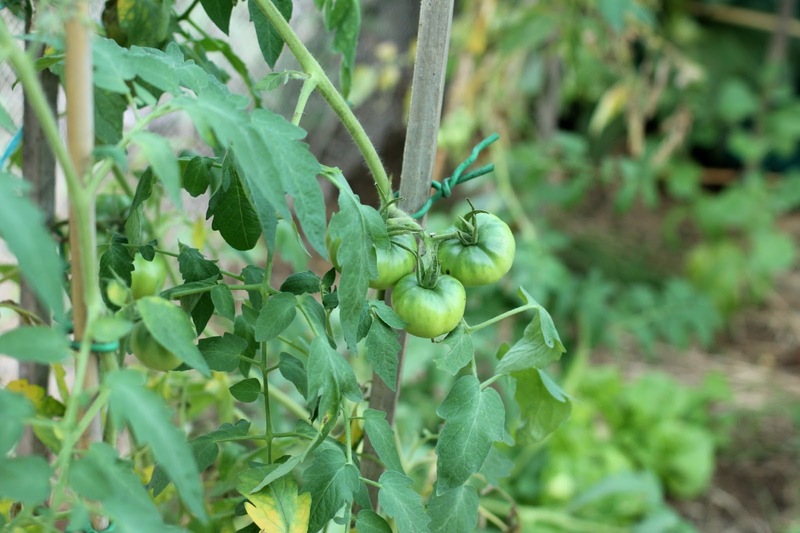 As a result, the tomatoes that had set and were getting ready to ripen have that look about them - that look that I know means that they'll rot before they ripen if I leave them on the bush. So I picked all the fruit from the dead bushes, hoping to have enough to make a small batch of Green Tomato Chutney. I was quite pleased when I weighed them later that night to find I had a large bowl weighing two kilos. I did want fresh tomatoes, rather than more chutney, but chutney is delicious and it's better to have something than to loose the crop entirely. Anyway, I enjoy preserving days and don't get to do it nearly often enough, so I'm looking forward to chopping and stirring and bottling tomorrow. I'm hoping the other bush stays alive, at least long enough for the tomatoes on it to ripen. Also in my basket from the veggie patch the other evening was three small zucchinis, two with their flowers still attached. These are an heirloom variety, 'cocozelle'; I'm very impressed with their performance as our other variety of zucchini died off when the heat arrived back in Novemeber. I'll definitely be putting in lots of these Cocozelles throughout the year. Lettuces are still going strong, I've got to put in some more this coming week. The only trick is keeping the water up to them and picking them before they rocket to seed. My lone cucumber bush is producing well, I've been picking a cucumber from it every couple of days. It's fruit is very tasty and lovely and crunchy! I mean to plant some more of these soon too. Other odds and ends from the garden include a handful of capsicums, our last for some time I suspect, and also some chillies. The chilli bush is covered in flowers, I see chilli sauce in the future! Perhaps the item I found the most exciting when foraging in the veggie patch the other evening was a little egg. Our Silkies have started laying again, well at least one hen has, hopefully the rest follow suit. We're certainly not feeding ourselves from our veggie patch at the moment, but the garden is still producing which is what I set out to achieve. 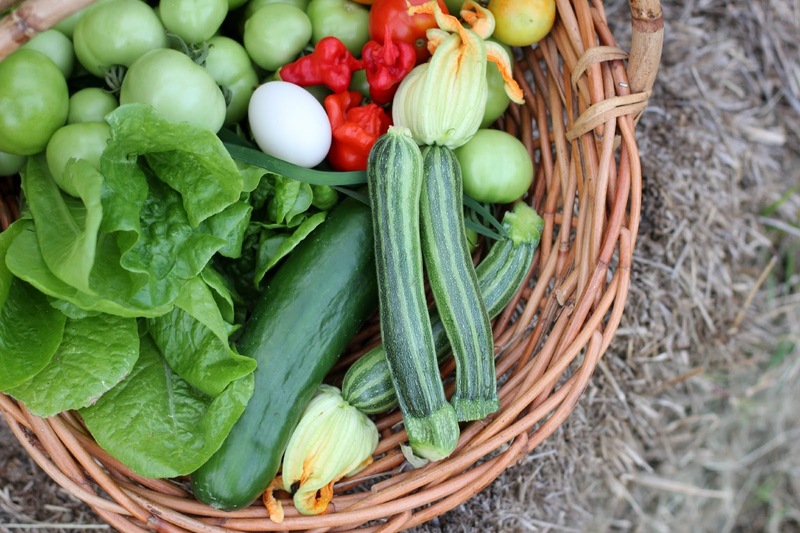 I know full well summer is not our most productive time of year in this part of the country, but I'm really pleased with what we are still managing to grow, and felt so grateful when I managed to fill the basket. And besides, we're keeping ourselves in milk, beef and chicken, with the odd egg thrown in there too. And there's our two hard cheeses maturing away in the cheese fridge. 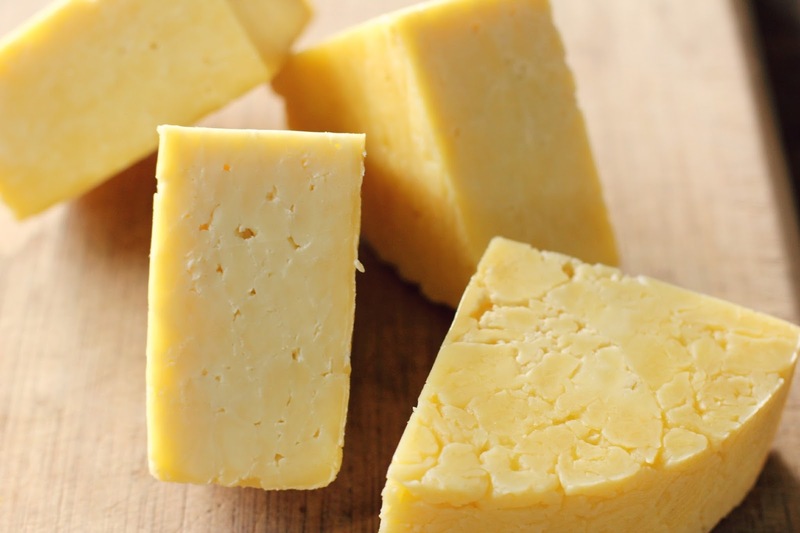 We tasted the cheddar before frigding it, and oh my! It had the most beautiful, delicate flavour. I think in a months time it'll be just right, as I don't like sharp cheese. The taste has made me forget the intensive cheddar making process, I think I'm quite willing to make another. Whilst so much of the veggie patch is not able to grow at this time of year, I am still feeding and looking after it. Nurturing the soil. I'm embracing the heat as it makes wonderful composting weather, and I've been busy working my way through the garden, giving the soil a sprinkling of lime and sawdust, a drink of seaweed and covering it with thick layers of mulch and compost. These are the gardens that have had the chickens living in them, so the soil has already had a good working over and plenty of chicken manure. With the heat and some water, and a few green manure crops, the soil should be beautiful in no time. What are you growing or making in your part? Hope you're keeping warm Eleanor, northern hemisphere winters are quite different to the ones we experience here I think! At least in this part of Australia anyway, down south they get quite chilly. Fresh tomatoes are the best. One of my favorite sandwiches is a tomato sandwich and is one of the things I look forward to once summer is here. Your produce looks great. 1. Cheesemaking - Perhaps this is a bit like childbirth - a lot of pain with great rewards? Sheesh, your cheese is just gorgeous! It's stunning, actually. Super impressed that you went to all that work! Hi, I have had that happen with tomatoes before, so disappointing. But good news that you managed to use them green. Love that green chutney.